Wandering City Blues: Daydreaming (New Excerpt!). After last week's unimpressive amount of creative output, I decided to hunker down this week and try to make up for lost time, punching in over 4,000 words - which would've likely been closer to 5,000 if I could stop playing Uncharted 4. Nevertheless, I made some great progress. More on that in a moment. I've noticed while writing this book that I worry about something I never realized I'd worry about: time passing. You know how, in movies, sometimes it'll seem like it's only been a few days of activity but near the end a character will say something like "Well, over the last few months since all this happened..." and it seems crazy? I'm concerned enough with that happening to me that I find myself doing the opposite. In the main story, there have been three deaths, a murder investigation, a journey from Johannesburg to Paris to New York and over a half-dozen languages and civilizations mentioned...and I think the whole thing has taken place in about four weeks. Fortunately it seems to be flowing at a realistic pace. Anyway! 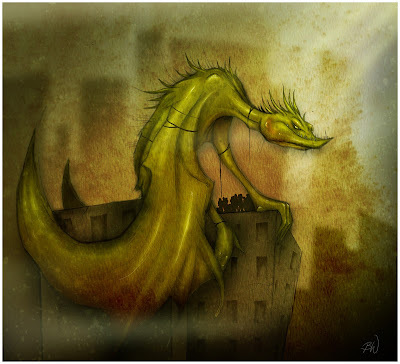 This week I introduced Psamanthe, my flying colossus, in the book. I posted a "first look" at her a couple months back, but here she is again as a refresher. Psamanthe is populated almost entirely by Pacific Coast Indians - specifically the Tlingit and Haida. My mantra of sorts over the last several months has been that I want to express the diversity and population shift in the world of the leviathans, and as animists with an avian deity, the Tlingit seem like the best choice to populate Psamanthe. They help Leon travel from Paris (where he disembarks Triton) to New York to follow a lead in his case. On the long flight to the West, Leon finds himself lapsing into a daydream, remembering an old conversation he had with his grandfather when he was a boy. In the conversation, Leon's grandfather tells him about several of the other ways people tried to leave the surface when the fog came out of the ocean. Here's a section of that conversation. Leon's grandfather had also told him the saddest story of survival in vain – the story about the people who fled to mountaintops and other high places, believing the early, unsupported rumors that the 1,000-foot fog ceiling that rolled in from the seas would become thinner at high altitudes. “’Oh, the air in places like Mount Kilimanjaro and Mount Everest is so thin, there’s no way the fog could creep very far up them,’” his grandfather said, imitating early evacuees with a tone of flippancy. “’You wouldn’t have to go up to where you couldn’t breathe – just a few thousand feet from the base would do it.’” He shook his head and took his own voice back on. “Some of them even built greenhouses to get fresh oxygen further up there, sonny. You had whole swarms of folks just trying to buy up land and build housing further and further up the sides of Makalu and Mont Blanc and Denali.” He sighed. His grandfather paused to let the thought sink into Leon’s head. Thanks for reading! As always, please share with your friends and let us know your thoughts at A Carrier of Fire's Facebook page. An Island of Unbridled Malevolence. Medieval Siege Weapons and SRT'S for Dummies.